Pre-1980 figure prototypes are extremely scarce. And when they have turned up, they have tended to be first shots injection molded in the colors of plastic used during mass production. In other words, they aren't incredibly interesting. This figure, however, is a great prototype example of one of the first 4 Star Wars action figures. 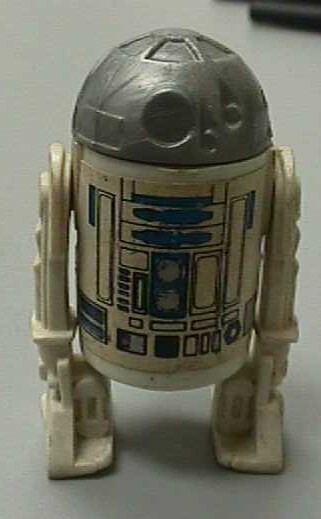 As you can surely see, the primary point of interest about the piece is its lack of a silver vac-metallized coating on its "head"--while the domes of the production R2-D2s were shot in a whitish color of plastic and then vac-metallized, this one is a dull gray and has no metallic coating at all. The sticker is also slightly different from the one used in production. In addition, the bolt that affixes the "head" to the "body" on the regular figures is here absent; instead, a large screw was used, the head of which can be seen by looking up the cavity present in the core of the "body" cylinder. But it's the gray head that makes this one a real attention-getter.